In 1891 the Petit Journal organized the first Paris-Brest-Paris, a real success judging by the over 400 registrants. 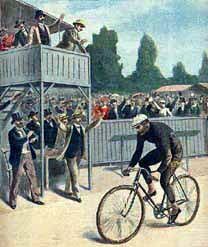 Pierre Giffard, head of the newspaper, decided that the event would be held once a decade, given the difficulty of the event-1200 KM on the roads of the day, before the invention of asphalt! Sixteen checkpoints were planned and the headlines of the newspaper read "National Bicycle Race ...". Charles Terront won the race in 71:35 with an average of 17.590 KPH on the way out and 16.780 on the way back. Jiel Laval was second at more than eight hours behind Terront and Coulliboeuf was third. Fewer than thiry finished the race; many coming in days later. 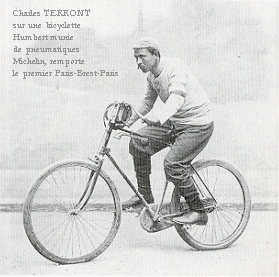 In 1901 the race became international in nature with two categories-racers and tourists (the ancestors of randonneurs). Randonneurs existed at the time, but they had not yet taken on such adventures. As in 1891, participants were allowed to have a crew of cyclists to draft. Maurice Garin won in 52:11, beating Rivière by 1:55. Aucouturier, Fédérick and Miller, an American, finished in that order respectively. 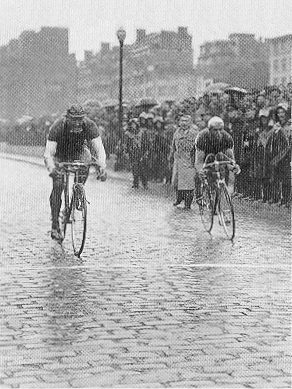 In 1911 Emile Georget won in 50:13, beating Lapize by 0:21. Ernest Paul was 0:35 off the pace and Cornet finished fourth. Drafting crews were not allowed, but racers could change bicycles. Tourists were not allowed a change of bikes; as a precaution against cheating, bikes were tagged. In 1921 Louis Mottiat, a Belgian, won in 55:07:08. Eugène Christophe, Heusghem, Masson, and Sellieer finished next in that order. In 1931 an Australian won. Hubert Opperman won in a sprint to the finish, beating Marcel Bidot. Sir Hubert Opperman, a dear friend, who's always Oppy to us, keeps in touch. He just celebrated his 83rd birthday on the bike and will surely be happy to help us celebrate PBP's centennial anniversary in 1991. The PBP's of 1948 and 1951 would be the last to see pro racers, whose numbers had been diminishing anyway. Racers were fairly numerous in 1948, but participation in 1951 was considerably less, when Maurice Diot would be the last professional racer to win PBP-setting the standing record of 38:55. In 1931 the Audax Club Parisien, which had created the free pace Brevets de Randonneurs Français in 1924 and which had also noticed the rising interest in long randonnées, decided to organize a 1200 brevet on the Paris-Brest-Paris route. The Union des Audax Cyclistes Parisiens, which had kept the fixed pace Audax formula introduced to France in 1904 by Henri Desgranges, also ran a 1200 KM Audax style event. The two clubs still exist. The last PBP Audax was organized in 1986, with 5 sessions and nearly 1000 participants. The next PBP Audax is scheduled for 1991 to celebrate the centennial anniversary. A session is planned the same week as the Randonneurs version. In 1931 there were 64 registered; 60 started and 44 finished. The finishers included 4 mixed tandems, one men's tandem and two women's singles. Since the clubs were still rivals at the time and since the wounds from the split in 1921 were still fresh, it was noted with pleasure that the rival club had barely managed to have 20 or so finishers. Cottard, Ruard, and Tranchant finished together in 68:30; the fourth arrived 50 minutes later. Number 5, Louis Cointepas, who had a pleasant time on the coast finished 2 hours later. Number 6 and 7 came in 2:20 off the pace and then the gaps jumped to 10 hours off the pace. Mr. and Mrs. Danis set the best mixed tandem time of 88:10, 25 minutes ahead of Louis and Juliette Pitard. Paulette Vassard the only women's single rider finished in 93:25. For obvious reasons there was no PBP in 1941. The ACP decided to replace this missed event with one in 1948 and then another in 1951 to get back on schedule. In 1948 there were 172 registrants. Four men's tandems and 11 mixed tandems figured amongst the 159 starters. Of the starters, there were 127 who finished, the first two being René Bernard and Raffaitin in 51:15. The team Routens & Fourmy set a men's tandem record at 51:15. Mr. and Mrs. Rebour did the same for mixed tandems at 61:56 and that with a delay in Pré en Pail to fix an axle. Louis and Juliette Pitard chalked up their second mixed tandem finish. In 1951 the crowd grew. All the major randonneurs of the day were there. All told, there were 446 registrants, 8 women's singles, 3 men's tandems, and 14 mixed tandems. Of the 418 singles and the 13 tandems starting, there would be 351 to sign in at the finish-amongst them 6 women's singles, 2 men's tandems, and 9 mixed tandems. The men's tandem team of Routens & Fourmy did it again, setting a record of 47:54 that still stands! Jasserand & Deberne finished in 48:59. For the mixed tandems, Gillet & Seurin, who had a been penalized 10 hours and had finished second in 1948, took first with 49:29-another standing record. Louis and Juliette Pitard finished their third PBP, 20 years after their first. For single bikes, the battle was a bit tougher. A dozen arrived together at Brest, where Chetivaux and Coutellier deciding to move out early, constantly increased their lead on the others to almost 3 hours at the finish. For the first time, the singles broke the 50 hour mark, arriving in 48:25. Blanc, Dumoulin, Letronnier, and Masson finished in 51:19. Audriberti arrived in 52:21. Five years later in 1956 the Paris-Brest-Paris Cyclos returned with both a Audax and a Randonneurs edition being organized. Unfortunately the tide was waning; only 232 registered, amongst them 4 women's singles, 2 men's tandems, and 5 mixed tandems. The two men's tandems stayed together most of the ride, finishing together in 50:21. Starting, as was the custom at the time, with the mixed tandems one hour before the singles, they would never be caught, adding a second hour to their initial head start. Routens & Fourmy and Bulte & Decker finished in 50:21. In the mixed category there were two finishers: Mr. and Mrs. Covo in 88:30 and Mr. and Mrs. Combe in 89:15. In the singles category Baumann and Lheuillier fought a hard battle that lasted for more than 350 KM. In Pontchartrain, Roger Baumann finished up the hills and when Lheuillier turned the last curve before the straight away, he saw the tail light ahead of him, but it was too late. Baumann finished in 52:19 and Lheuillier in 52:30. Third place went to Espinasse who lost an hour between Houdan and Paris. In 1961 registration was down to only 179, which included 3 women's singles and 4 mixed tandems. Like 1956 the percentage of DNF's was very high-almost 30%. There were many reasons: a really fast start (more than 40 KM in the first hour) and bad weather for two, not as bad as in 1956, but pretty bad nonetheless. This didn't stop the phenomena known as Fouace from lowering the record time to 46:18, some two hours better than the previous record. For the mixed tandems, Daniel and Mrs. Provot set the pace, finishing in 59:47. In the women's singles, Jeanne De Andris set a record time of 62:03. Following Fouace were Nedellec at 40 minutes off the pace and Bulte at 3 hours. Baumann came in seventh with 56:45. 1966 was the last of the 'thin' years for participation. Only 167 started, including one women's single and two mixed tandems. One hundred thirty singles finished, as did the women's single and the two mixed tandems. Mr. and Mrs. Veau did 66:24 and Suzanne Pinault finished in 89:50. The first two finishers in the singles category lowered the record to 44:21. They were Macaudière and Demilly. Third place when to the little Belgian, Herman De Munck. This PBP was noted for really hot weather, as compared to the two previous PBP's. In 1971 substantial progress was made. The weather was good and we had the honor of receiving Sir Hubert Opperman, the 1931 winner of PBP. He drove the PBP course with us and was really pleased to see the large number of riders. He loved being in the center of a big cycling event again and was equally pleased to cheer Louis Bonny who was leaving Brest as we arrived. He had taken only 20 hours and a few minutes to make it to the Brest checkpoint solo, that at about an average of 30 KPH for the first 600 KM of the course. De Munck left alone before Lamballe. He was joined par J. Richard, Jaffrelot, and Coulomb. But at Bedee when the others were taking too long for him, he decided to leave alone. The others would never see him again. He finished in 45:39 beating Jaffrelot by three hours. Richard and Baleydier, who had been having knee problems since the 500 KM mark, arrived barely an hour later. Mr. and Mrs. Veau finished in 64:08; the men's tandem Begnigaud & Lamotte arrived in 70:30. The women's singles' results were mundane; of the 8 starters, 5 finished in more than 80 hours. In this edition of PBP, eight randonneurs returning Sunday with the Audax from their PBP Audax, lined up on the starting line for PBP Randonneurs, which left on Monday at 4:00 PM. They all finished. The best at this game was Patrick Plaine who turned in a 55:18. Belleville finished in 68:55 and the others followed: Boubarre, Texier, Guillaume (who would be killed in the 1975 PBP), Lucas, Coussemene, and Bonnin. Each of them had done 2400 KM in less than a week (Thursday to Thursday). In 1975 there were 704 singles, 687 men and 17 women, 2 mixed tandems, 4 men's tandems, and 4 English tricycles-another PBP first. The percentage of DNF's dropped to 16%, another first, and the records for both men's and women's singles were improved significantly-43:27 for the trio Cohen, Truchi, and De Munck. They beat Movran, Baleydier, whose knee was better, and de Mun. Twenty-one finished under 50:00 (the winning time of Opperman in the 1931 pro division). On the women's side, the record fell by 5 hours. Suzy Carvalho finished in 57:02 in 42nd place overall. There were 554 singles still behind her, pretty good, huh? Among the 17 women's singles who finished was the young Catherine (USA) who was 18 the just before the start. Ms. Dequatre & Mr. Jouffrey turned the third best time ever for mixed tandems, finishing in 51:32. The best men's tandem's time was 54:46. The best tricycle time was set at 74:03. In 1979 registration would exceed 1800, 1865 to be precise. Amongst them were 57 women, of which 45 were women's singles, 4 were mixed tandems, and a new first a women's tandem. The latter finished well with a time of less than 87 hours. Also of note this year, M. C. Guillaume, who had done her PBP the preceding year, did the whole route as roving controller-but on her bike! This was a bad year for De Munck who was disqualified. No doubt had this not occurred he would have been right there with Baleydier, on whom good fortune finally smiled, and Piguet who finished together in less than 45 hours, and with a two hour lead over the other 4 leaders: Doncque, Bertrand, and Robert. The first mixed tandem to finish was Jouffrey & Dequatre who, like four years prior, finished in less than 53 hours. Mrs. Bouillerot was the first woman to finish-in less than 69 hours. With a total of 1573 finishers, just a shade over 16%, the numbers were where they should have been. In 1983 the record was set with 2165 riders registered. This year a lot of records would fall. First the in mens' singles Bernard Piguet and Hermann De Munck, still there that one, both finished with 43:24. They had ridden alone from Villaines la Juhel. Following them were Fantino, Sauret, Poncin, and Dickson-the first American to finish that year. They arrived in 44:40. With them was Luis Garcia, Richefort, and Lelaquet who had started at the 10 AM start, giving them a finishing time of 50:50. The first woman to finish was Susan Notorangelo. Her time of 54:40 beat the previous record of Suzy Carvalho by 2:20. There were only 38 finishers before her. These included the men's tandem Navaro & Descazals and the mixed tandem Jouffrey & Dequatre, who finished in 51:35 and 51:45 respectively. Another record set was that of the oldest rider. Pierre Dubois from Rennes finished his fifth PBP at the age of 75 and 4 months! Since the city of Paris recognizes those having done 6 PBP's with a medal, Mr. Dubois is considering another PBP in 1987. Also of note were the times of women's riders Nicole Chabirand and Chantal de la Cruz, who both finished in less than 57 hours. The final record was set for the DNF's. With only 10% calling it quits, this PBP set an all time record. What is 1987 going to be like? Find out next August 24. Undoubtedly, it'll be a 'grand cru' before an exceptional centennial PBP in 1991!